← Recovery: Was that it? The Tories and welfare: Machiavellian or just muddling through? This week, the IFS finished their painstaking task of trying to understand the parties’ tax and spending plans, based on what little they’ve said. There are gaps and inconsistencies in all of them. At first sight, I couldn’t understand why the Conservatives’ public service spending plans in the first IFS analysis didn’t look as bad as those implied by the last budget. Then when I looked more closely I realised that the numbers assumed that £12 billion of the cuts would come from welfare, as the Conservatives claim. This week, the IFS scrutinised the parties’ tax and benefit plans in more detail. They concluded that the Conservatives’ £12 billion welfare cuts are complete garbage. They didn’t actually say that, of course, because they are far too professional and polite but that was the gist of it. The £1.2 billion of benefit cuts outlined in the Conservative manifesto are rather dwarfed by their commitment to find £12 billion of cuts to annual spending by 2017–18. The Conservatives have been talking about saving £12 billion from the social security spending for a long time. It is disappointing that no further details have been spelled out in their manifesto. They also pointed out that most of the welfare cuts during the last parliament were made by increasing benefits by less than inflation. 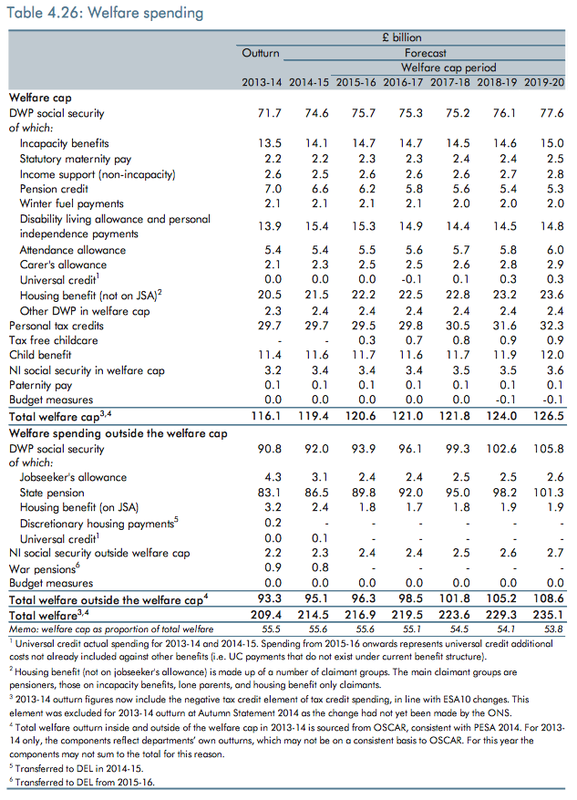 This time, to achieve their £12 billion target, the Conservatives would have to cut the cash amounts paid to claimants. We do not know the precise distributional consequences of the planned £12 billion of benefit cuts, nor their effect on the shape or coherence of the system, because the Conservatives have not outlined how the vast majority of that reduction would be achieved. Three things are clear, however. First, aiming to reduce annual spending by £12 billion by 2017–18 is ambitious, requiring an increase in the pace of cuts compared to the current parliament. Second, it is not possible for the Conservatives to meet this target by increasing benefits by less than inflation – large cuts to cash entitlements would be required. 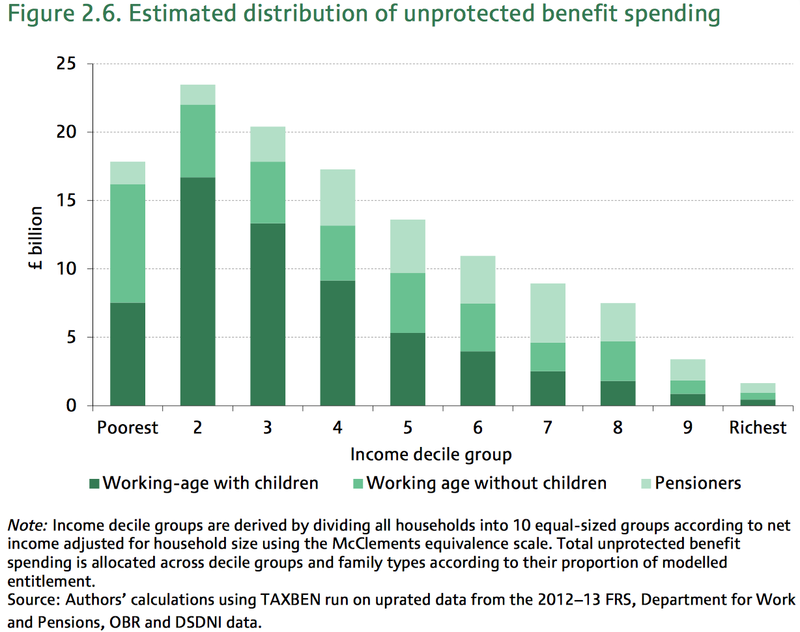 Third, those large cuts are likely to predominantly affect households towards the bottom of the income distribution. Furthermore, because the Conservatives have promised to protect most pensioner benefits, around half the social security budget is off limits. The cuts would therefore fall almost entirely entirely on working age people. Although there are no specific plans, the distribution of the unprotected benefits gives some idea of who would lose out the most. Given that, with the improving employment situation, Job Seekers’ Allowance and Job Seekers’ Housing Benefit is projected to fall anyway (and wasn’t that much to start with) any significant social security costs would have to hit the working poor and the disabled. The big lumps of social security spending are, in rough order, tax credits, housing benefit, disability allowance, incapacity benefits and child benefit. Cuts to anything else would make very little difference so any significant spending reduction would have to hit those five. This leaves the Conservatives with a problem. To take £12 billion off welfare, they will have to hit the hardworking families they keep telling us about. Which, as Patrick Butler said, is why they are so unwilling to spell out the cuts in any detail. Could a Tory government politically manage cuts on this scale? Their pre-election silence suggests they are not exactly supremely confident on this matter. Cuts were easy when “scroungers” were the apparent losers; they become much, much harder, politically, when they surprise and frighten potential and actual Tory voters. Will the £12 billion cuts actually happen if the Tories are re-elected? I very much doubt it. Going back to my opening comment, the main purpose of the £12 billion social security cuts is to make the public service cuts look less bad. To meet the deficit target without raising taxes, every pound that doesn’t come off welfare has to come off public services. Welfare claimants can be implicitly dismissed as idlers, so a vague promise to cut benefits doesn’t go down as badly as taking an axe to public services. By claiming to be able to cut £12 billion off welfare, George Osborne can call the OBR and IFS projections of public service cuts hyperbolic. Of course the public service budgets will look bad if the silly idiots don’t take account of my welfare cuts. I don’t believe the Conservatives will make their £12 billion cuts. The so-called secret plan that Danny Alexander leaked yesterday pretty much proves it. It wasn’t a plan at all, just an unfocused brain storm of ideas for how such cuts might be made. Even with a bit of wacky blue sky thinking, they could still only get to £8 billion. And they dismissed most of the ideas as too difficult. The Conservatives have denied that the cuts in the leaked document are part of their plans but in so doing have almost admitted that they have no idea how they will make their £12 billion. To call this document a secret plan is to flatter the Conservatives. They haven’t a clue how to make £12 billion of welfare cuts. I don’t think they have a clue how to take another £40 billion off public service spending either. Their strategy, such as it is, is to get elected and then work out how to do it all afterwards. The same could be said of the other parties, of course, but their spending claims are nowhere near as wild. 5 Responses to The Tories and welfare: Machiavellian or just muddling through? I am surprised the opposition parties aren’t being more persistent in calling the Tories out on their total failure to specify how they are going to cut £12bn from welfare. As Rick points out, the big 4 Welfare categories within the cap, Working Tax Credits, Housing Benefit, Disability Allowances, and Child Benefit, represent £92bn, or 77% of the “Capped” total. To make really chunky savings you have to go after some or all of these. Means testing Child Benefit has to be the least worst option here, at least politically, although long term a major housebuilding programme to reduce the Housing Benefit bill has to be best. But it’s all very difficult, hence the equivocation from Cameron. And that brings us to Pensions. It’s to be admired that pensioner households are on track to be better off in 2015 than they were in 2010 (http://blogs.lse.ac.uk/generalelection/real-wages-and-living-standards-the-latest-uk-evidence/). But today’s You Gov poll at https://yougov.co.uk/news/2015/05/01/labour-lead-1/ gives a useful reminder of the electoral payoff of looking after pensioners. The voting intentions of the over 60s (overall results in brackets) are 41% (34%) Tory, 30% (35%) Labour, 16% (12%) UKIP, 8% (8%) Lib Dems, 6% (11%)Others; and crucially, 85% (74%) are absolutely certain to vote. Older people back the Tories, and are more likely to vote – Simples.